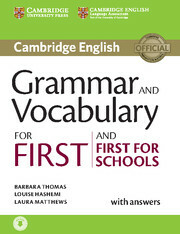 Cambridge Grammar and Vocabulary for First and First for Schools provides complete coverage of the grammar and vocabulary needed for the Cambridge First exams, and develops listening skills at the same time. It includes the full range of First and First for Schools exam tasks from the Reading and Use of English, Writing and Listening papers, and contains helpful grammar explanations. This edition is updated for the new exam to be introduced from 2015. It is informed by the Cambridge Learner Corpus to ensure that the language tackles real learner errors. The accompanying listening material is available online for download. Presents grammar through listening material to help improve listening skills. 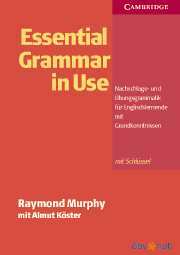 Contains clear and reliable grammar explanations with lots of examples, making it ideal for learning new grammar points or as a reference. Provides exam preparation as it helps students to practise a range of exam tasks. Includes a grammar glossary which explains difficult concepts simply, and key word lists, including collocations and phrasal verbs, which provide a useful checklist and revision resource. Includes online material addressing the separate needs of candidates for the Cambridge English: First exam and Cambridge Engish: First for Schools. Covers all the vocabulary needed for the First Certificate exam with exam practice of all papers. Informed by the Cambridge International Corpus, including the Cambridge Learner Corpus ensuring vocabulary is presented in genuine contexts, and covers the errors that students really make. Common learner error warnings help students to be aware of and to avoid making common mistakes. The topic-based unit approach means the material can easily be used to supplement an exam coursebook.